Insulators isolate the electric fencing wire from posts and help maintain good line tension. 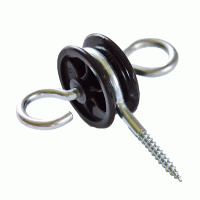 Our high quality insulators will not allow wire to work loose or current to leak away. 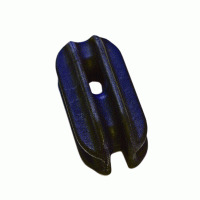 Use our steel stake insulators to fix the wire at any height according to the needs of your stock. 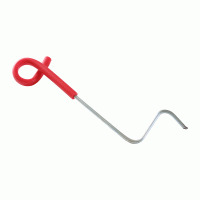 Will fit any steel electric fencing stake from 6mm to 13mm. Effective electric fencing must be taut - our anchor insulators will take the strain of the fence wire and maintain good tension. 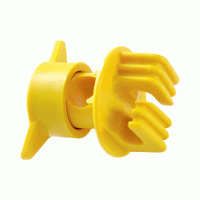 Use when beginning or ending an electric fence, or changing direction. 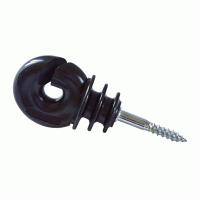 Choose from our range of fence insulators for use on timber posts in permanent electric fencing runs. Available in nail-on, screw-in or staple-on versions. A range of electric fencing insulators to hold various widths of polytape - robust enough to hold tape firmly in windy conditions. 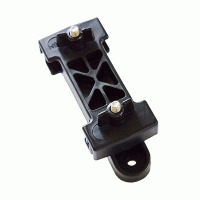 Gate insulators maintain the electrical connection from the electric fence to the gate. Unhooking the handle from the insulator automatically disconnects the power from the gate, leaving electric fencing energised via underground cable. Electric fencing offsets prolong the life of timber or wire mesh fences by preventing animals from biting, pushing and rubbing against it. They can also carry feeder wires to other electric fences.